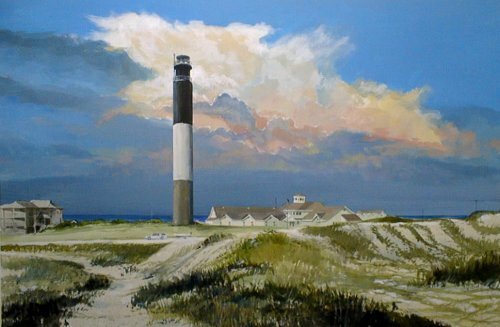 Built in 1958 and standing 169 feet high, the Oak Island lighthouse as with all modern lighthouses, has deviated from the traditional lighthouse look but serves the same function. The construction method used a round slip form. It consisted of a round steel tube inside another larger one. The space between the two tubes made up the thickness of the tower. Concrete reinforced with iron rods was poured into the form, allowed to dry and then the form was slipped upward making itself ready for the next pour. The process was continued all the way to the top of the lighthouse. The walls are only eight inches thick the entire way to the top, as opposed to older brick lighthouses that could have walls as much as five thick at the base with the thickness tapering towards the top. Another interesting feature of the Oak Island lighthouse is that colored concrete was used in the process so the three different colored bands never need painting. The foundation for the light reaches down seventy feet to bedrock and the lighthouse is designed to sway three feet in winds of one hundred miles an hour. Lightweight aluminum was used for parts of the lantern room including the floor and a helicopter was used to set the lantern room in place. The optics at the Oak Island lighthouse consists of a cluster of four powerful revolving lights. They are so powerful on its highest setting used during conditions of fog or bad weather, the beam of light can be powered up to reach an incredible 2,500000 candle power ranking it the most powerful lighthouse in the nation. It’s enough to scorch the skin of anyone standing in front of the lens. Protective clothing has to be used while working in the room.